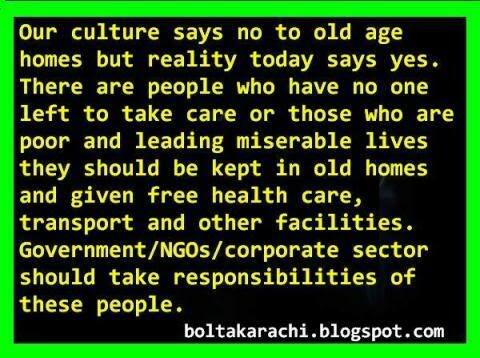 The Suffering Of Elderly People in Pakistan! HomeSufferingThe Suffering Of Elderly People in Pakistan! Elderly people (ages 60-85 years) comprise a significant number in our population and they should be treated with respect, care and love along with basic health and survival facilities by the government. On the contrary apart from people who could afford to look after their parents, the story of poor elderly people reflects misery, sorry and dejection in most of the cases. 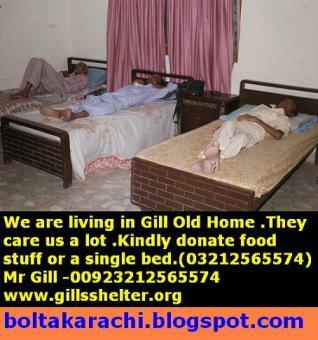 Some of the help if reaches the right people is being provided by Pakistan Baitul Maal and few NGO�s are also working for the betterment of old people who are fighting the after effects of age, lack of financial stability and love. 1. Elderly people die miserably due to lack of food and medical attention. 2. They develop psychotic disorders due to depression and dejection. 3. They develop certain diseases by not eating healthy food which is not providing the necessary multi-vitamins needed to survive in the old age. 4. Employees Old age benefits pension money is used by their family members. 5. They have very limited social life. 6. Lack of religious and basic education deprived them from doing anything useful to pass the time. 7. Children of even well settled families tend to ignore grandparents who just need to share love with them and focus. On paper, we are visionaries with excellent policies, that we had the right focus and right policies but the tragedy is we never got it implemented due to lack of resources cause our corrupt leaders every now and then tend to increase their personal resources by looting the National resources.